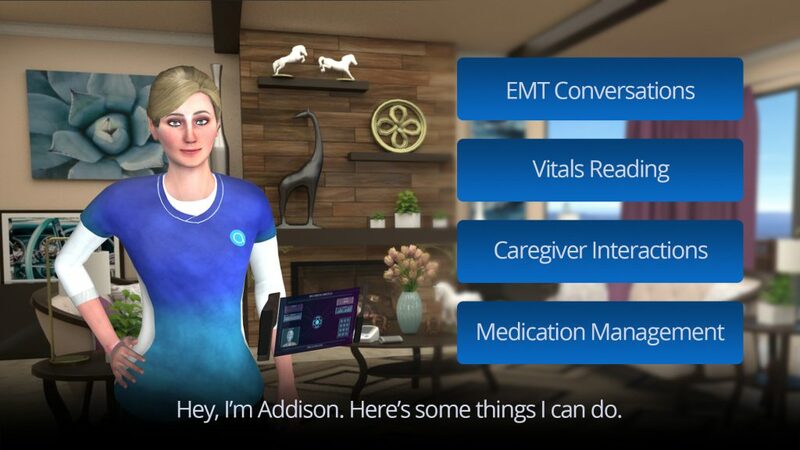 What else can a Virtual Caregiver do? Addison is the easiest way to provide affordable, comprehensive health monitoring and wellness support at home. If you speak and answer basic questions, Addison does the rest. 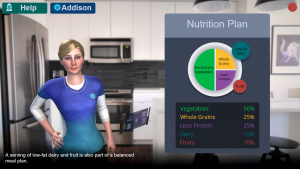 She can remind you to follow through on nutrition plans, take medication, check vitals, answer important questions, connect you 24/7 with a medical professional and provide assistance during emergencies. If you’re managing weight or a chronic illness, Addison packages are designed with wireless devices, such as a weight scale, non-contact thermometer, glucose meter, blood pressure cuff or pulse oximeter. Addison will remind you it’s time to check a vital, she’ll show you how to use a device, and they connect automatically. Artificial Intelligence means that you’ll get a one of a kind experience from Addison. She learns your preferences, keeps you on track and provides companionship unlike any other. Addison can alert users at the first sign of change in gait. Getting up from your chair a bit slower than usual? Dropping your toe? Addison will see, assess and give feedback to reduce fall risk and proactively prevent accidents. Powered by AWS and engineered by a team of computer scientists, animators, graphic designers and biochemists, Addison’s team of creators are a distinct group of people that know and understand both technology and the needs of the healthcare industry. Addison Care sets up in minutes. Addison appears in dynamic environments on strategically placed 15 inch screens. When there is something to remember, Addison reminds you. She can speak to you, demonstrate for you, respond to your inquiries, and assess your health status, risks, and improvements. Addison engages in ongoing conversations with you about your health and wellness with growing intelligence that continually improves over time. She can help you with monitoring blood pressure, body temperature, weight, blood oxygen, heart rate and blood sugar. She can also assist and encourage you with rehabilitation, weight management, nutrition and fitness programs. Addison can also check the outside environment and pollen count for people with allergies or lung sensitivities, and support to quit smoking. Addison is the ultimate companion and virtual health assistant for people who want to achieve long term health goals and quality of living. Health trends and alerts can be transmitted and/or accessed by authorized caregivers and providers for health, progress and recovery insights. Addison can also summon emergency response. Addison Care delivers new insights and efficiencies to clinical environments. Addison can be initialized to recognize a patient upon entering an exam room. She can update a providers records after completing a brief intake examination of a patient. A monitor is placed in the exam room. The patient hits a button that says begin. Addison will greet the patient and prompt them to engage wireless devices to collect blood pressure, body temperature, weight, blood oxygen, heart rate or blood sugar. She can review the patient’s plan of care, collect responses to questions about symptoms, and prepare the patient for a physician to enter. Addison Care also has gait and balance assessment program for orthopedic, podiatry and physical therapists. 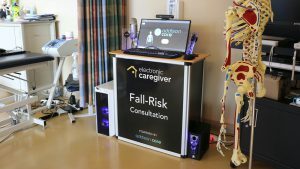 The Addison Care Fall Risk Kiosk can affordably and instantly assess fall risk and causing indicators, by measuring linear gait velocity, stride length, time in swing, cadence and time in double support. Addison can also identify postural instability by monitoring excursions from center of mass. Reports can instantly be created for clinical review in secured, encrypted, HIPPA compliant interfaces.